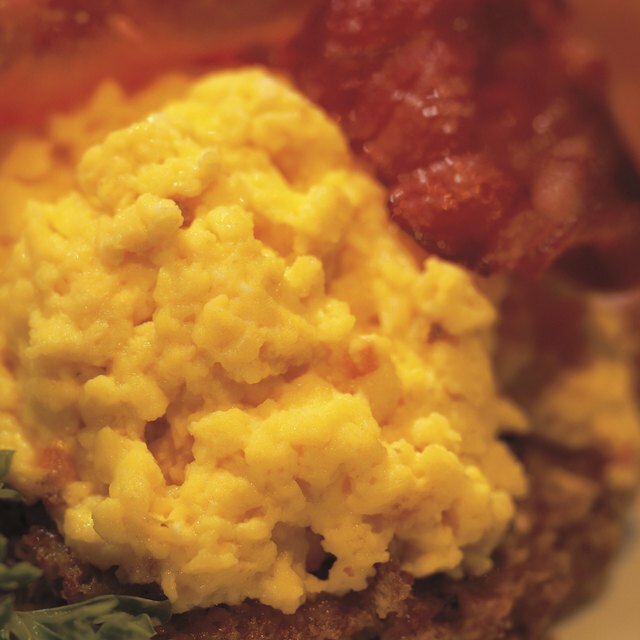 Scrambled eggs can make a hearty breakfast or healthy, light dinner. Eggs are a breakfast choice for many people, and with the addition of a few ingredients like salsa, sauteed veggies or seared salmon, scrambled eggs can become a quick and healthy dinner, too. Pack with the highest quality protein found in any food, one egg is just 70 calories, and scrambled eggs are simple to make, no matter what type of pan you prefer cooking with. Nonstick pans are usually coated with Teflon or some other kind of protective coating that prevents foods from sticking without the use of lubricant like oil or butter. Scrambled eggs are easily cooked in a nonstick pan by simply pouring mixed raw eggs into the pan and stirring them with a rubber spatula. Be cautious not to use a metal spatula or fork to stir the eggs, as the metal can cause the nonstick coating to peel off. Stainless steel cookware is the choice of many chefs and restaurants. The French Culinary Institute in New York City teaches all their students to cook using stainless steel equipment. A small amount of oil should be added to a preheated pan before the eggs are added to ensure they don't stick to the pan and burn. Cook the eggs over low-medium heat and stir constantly to get them to the right consistency. Cast iron pans have excellent heat retention and have become popular cooking tools in recent years. Cast iron pans can be purchased seasoned -- which protects the cast iron from rust and creates a nonstick surface -- or unseasoned, in which case the consumer must season it themselves. The stick-resistant coating of a seasoned pan will prevent eggs from adhering to the pan and burning, but a small amount of oil, butter or grease is still a good idea to ensure even cooking of the eggs and quick cleanup with a damp paper towel afterward. When cooking eggs in a cast iron pan, be sure to use a rubber or wooden spatula to stir your eggs, as metal utensils can scratch the pan and remove the seasoning. A double boiler, or Bain Marie, is made by stacking two pots on top of each other. Scrambled eggs cooked in a double boiler are often called "French-style" scrambled eggs. The bottom pot is filled halfway with water and placed on the heating source, usually a stove top, and the top pot is where the food is placed for cooking. Once the water begins to boil, its heat will rise and begin to cook the raw eggs placed in the top pot. Because the source of heat is indirect, you will not have to adjust the heat, but the eggs will cook a bit slower than if using any of the above mentioned pans. Fabiana Santana is a freelance food writer, editor and recipe tester and developer based in New York City. She has worked as a writer and editor for Singlemindedwomen.com, Chef Laurent Tourondel, "Family Circle," "Profile Magazine," Shecky’s, Julib.com, "Time Out New York" and many other publications. Santana is a graduate of the French Culinary Institute Culinary Technique program.